Carbon Craft is an experimental design project where I have relocated carbon fibre from the world of super cars and sports equipment to the world of crafts. 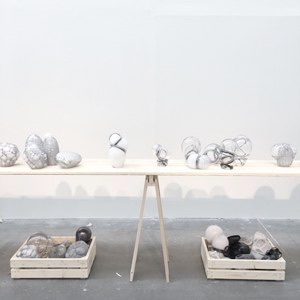 My focus has been on combining glassblowing and knitting, but since I am not a craftsman myself, I have collaborated with the glass artist Reino Björk, Smart Textiles in Borås and The Glass Factory in Emmaboda. The result is a series of experiments collected in an object library showing the results of these collaborations.